The locations of 8 robberies reported over Labor Day weekend. Gun icon indicates that a firearm was used. Brass knuckles indicates that "only" physical force was used. 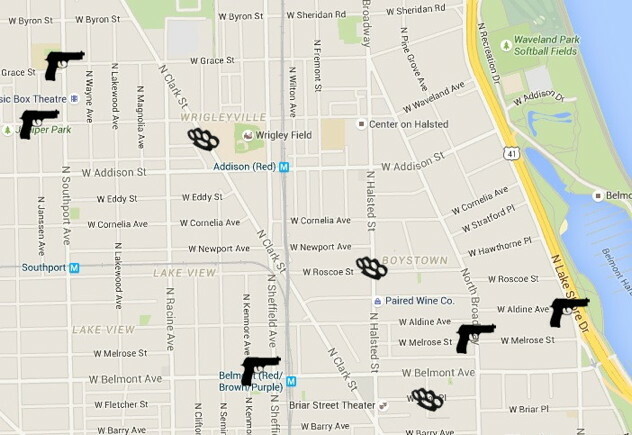 Six of the weekend's robberies were within Wrigleyville and Boystown proper. And five of them involved firearms. 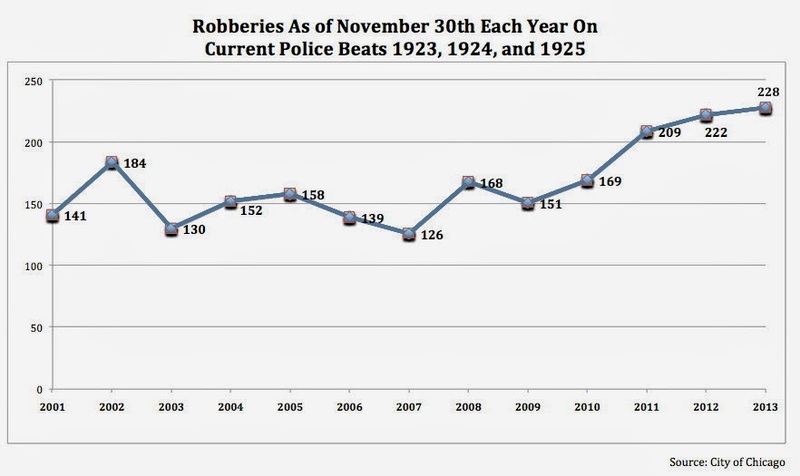 By comparison, Wrigleyville and Boystown had a total of 11 robberies reported in all of September 2014. Needless to say, with six cases racked up already, things aren't looking good for this month. Yet, when the Chicago Police Department on Monday released two alerts about robberies in our neighborhood, neither alert mentioned the mayhem that had rolled out over the weekend. Rather, one alert warned about robberies that happened more than a week ago and the other warned about a bank robber who hasn't struck in two weeks. Editors' note: For statistical purposes, CWB Chicago considers "Wrigleyville and Boystown" to be the area encompassed by Belmont, Irving Park, Southport, and Lake Michigan. In addition to the crimes covered in our weekend reports, we have now learned of an eighth mugging that took place about 4:30 on Saturday morning. A hearing impaired man told police that he was confronted and robbed near his home in the 700 block of Briar by a black man who wore a face mask and wore all black clothing. In a small piece of good news, officers responding to a report of suspicious people near the steps of Inter-American Magnet School, 851 W. Waveland, yesterday morning found that one of the individuals had an outstanding robbery warrant. He was taken into custody. There is no indication that he was involved in any of the latest incidents.